Shorty's Rescue - Grupo Luigi Rossi de América S.A.
We are glad to announce that we are extending our mission to Mexico so we can continue to rescue, rehabilitate and re-home bully breeds as we do in the USA. Listed below is our Mission for Shorty’s Rescue in the USA & Mexico. This year Shorty’s Rescue will be opening a rescue center and clinic in Mexico, and the clinic will be called Hercules’ Clinic. Offer monthly free veterinary care to low-income individuals and families. Provide free monthly dog obedience training classes to low-income individuals and families. Rescue, rehabilitate, train, and re-home bully breeds. Offer free spay and neuter clinics to low-income individuals and families. Participate in Keynote Speaking Engagements. Enlighten Bully Breed Breeders of their contribution to the homeless Bully Breed Population. 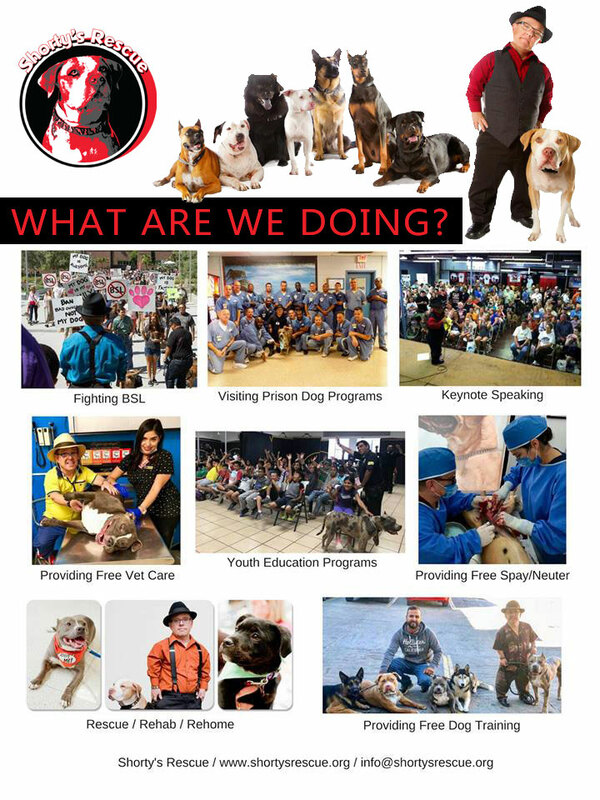 Pet Owner Support Program to keep our Bully Breeds where they belong by providing food, veterinary care, and training to qualifying individuals. Education Resource for responsible Breed Guardianship, Breed Awareness, Animal Rights, and fighting against BSL (Breed Specific Legislation) laws. Creating a strong voice against stereotyping and stigma—we do not seek your pity and don’t appreciate your prejudice. We are here to help one discrimination case at a time through education, enlightenment and to fight, if necessary, for the underdogs of the world. We would like your help. Please donate. We enjoy hearing any comments from you, so please feel free to email us your comments. Shorty’s Rescue, Inc. is a 501(c)(3) non-profit organization with a public charity 170 (b) (1) (A) (vi) classification and you are entitled to a tax deduction for your contribution. If you require tax information or proof of IRS charity classification you can email us at info@shortysrescue.org to request that information.